Window manager: Managing themes and how windows behave. Panels: Contain the system tray, menu, and quick launch icons. Menus: Easily access apps and controls. File Manager: Manage and organize files. Office Suite: Create documents, spreadsheets, and presentations. Text Editor: Create simple text files and edit configuration files. Display Manager: Adjust your screen and graphics. This guide provides a list of the most commonly used desktop environments. Choosing a desktop environment depends a lot on your personal taste. This list isn't in any particular order. Choose your favorite based on which elements are the most important to you. Many features not as customizable. The Cinnamon desktop environment is modern and stylish. The interface will be very familiar to people who have used any version of Windows prior to Windows 8. Cinnamon is the default desktop environment for Linux Mint and it's one of the main reasons why Mint is so popular. There is a single panel at the bottom, a stylish menu with quick launch icons, and a system tray in the bottom right corner. There are a range of keyboard shortcuts that can be used and the desktop has lots of visual effects. Cinnamon can be customized and molded to work the way you want it to. You can change the wallpaper, add and position panels, and add applets to the panels. Desklets can also be added to the desktop to provide news, weather and other key information. Audio, photos and video apps integrated into the desktop. Great search features and filtering. Lack of good notification system. Unity is the default desktop environment for Ubuntu. It provides a very modern look and feel, dispensing with a standard menu and instead providing a bar containing quick launch icons and a dash style display for browsing applications, files, media, and photos. The launcher provides instant access to your favorite applications. The real power of Ubuntu is the dash, with its powerful search and filtering. Unity has a range of keyboard shortcuts which makes navigating the system incredibly simple. Photos, music, videos, applications, and files all integrations neatly into the Dash, saving you the trouble of actually opening individual programs for viewing and playing media. You can customize Unity to some extent, although not as much as with Cinnamon, XFCE, LXDE, and Enlightenment. However, you can move the launcher if you wish to do so. As with Cinnamon, Unity is great for modern computers. Many core applications and a development kit. Fairly rigid with minimal customisation. Not as many features as other desktops. The GNOME desktop environment is much like the Unity desktop environment. The main difference is that by default the desktop contains a single panel. To bring up the GNOME dashboard you need to press the super key on the keyboard, which on most computers shows the Windows logo. GNOME has a core set of applications included, but there are also many other applications specifically written for GTK3. As with Unity, GNOME isn't hugely customizable but the sheer range of utilities makes for a great desktop experience. There is a set of default keyboard shortcuts which can be used to navigate the system. Instantly familiar to people used to Windows. Provides a great set of default applications. Some components are very complicated. No easy backup and restore. KDE Plasma provides a desktop interface similar to Cinnamon but with a little bit extra in the guise of Activities. This desktop follows the more traditional route with a single panel at the bottom, menus, quick launch bars and system tray icons. You can add widgets to the desktop to access information like news and weather. The look and feel of the KDE applications are all very similar, they have a huge array of features, and are highly customizable. KDE is great for modern computers. Looks outdated compared to other desktops. XFCE is a lightweight desktop environment which looks good on both older computers and modern computers. The best part about XFCE is the fact that it is highly customizable. Absolutely everything can be adjusted so that it looks and feels the way you want it to. By default, there is a single panel with a menu and system tray icons, but you can add docker style panels or place other panels at the top, bottom or sides of the screen. There are a number of widgets that can be added to the panels. XFCE comes with a window manager, desktop manager, the Thunar file manager, the Midori web browser, Xfburn DVD burner, an image viewer, terminal manager, and a calendar. Very lightweight and great older computers. Not the greatest menu system. Default apps aren't the best available ones. The LXDE desktop environment is great for older computers. As with the XFCE desktop environment, it is highly customizable with the ability to add panels in any position and customize them to behave as docks. This desktop is very basic in its nature and is therefore recommended more for older hardware. For newer hardware XFCE would be the better option. Doesn't look as good as more modern desktops. Not as lightweight as XFCE or LXDE. MATE looks and behaves like the GNOME desktop environment prior to version 3. It is great for older and modern hardware and contains panels and menus in much the same way as XFCE. MATE is provided as an alternative to Cinnamon as part of the Linux Mint distribution. 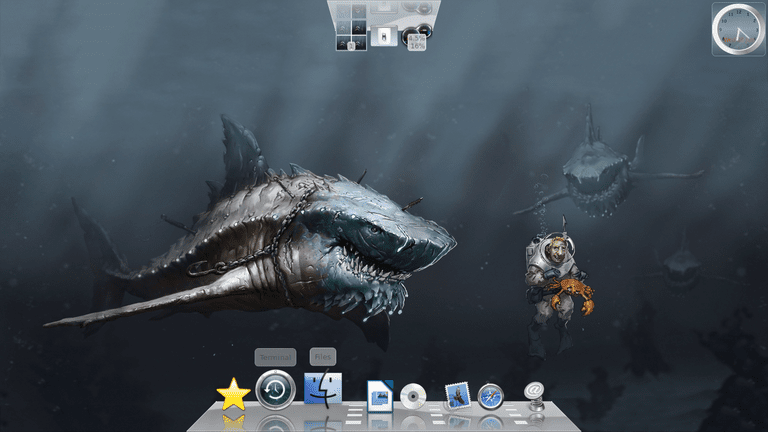 The MATE desktop environment is highly customizable and you can add panels, change the desktop wallpaper and generally make it look and behave the way you want it to. Can feel a bit quirky when compared to other desktops. Enlightenment is one of the oldest desktop environments and is very lightweight. Absolutely every part of the Enlightenment desktop environment can be customized and there are settings for everything, which means you can really make it work how you want it to. This is a great desktop environment to use on older computers and is one to consider over LXDE. Virtual desktops feature prominently as part of the Enlightenment desktop and you can easily create a massive grid of workspaces. Enlightenment doesn't come with many applications by default as it started out as a window manager. May be too simple for some users. Known to by somewhat buggy. The Pantheon Desktop Environment was developed for the Elementary OS project. The term pixel perfect springs to mind with Pantheon. Everything in Elementary has been designed to look great and therefore the Pantheon desktop looks and behaves brilliantly. There is a panel at the top with system tray icons and a menu. At the bottom is a docker style panel for launching your favorite applications. The menu looks incredibly crisp. If desktop environments were a work of art then Pantheon would be a masterpiece. Functionality-wise it doesn't have the customizable features of XFCE and Enlightenment and it doesn't have the applications available with GNOME or KDE but if your desktop experience is merely launching applications such as a web browser then this is definitely worth using. Trinity is a fork of KDE before KDE went in a new direction. It is incredibly lightweight. Trinity comes with many of the applications associated with KDE although older or forked versions of them. Trinity is highly customizable and the XPQ4 projects have created a number of templates that make Trinity look like Windows XP, Vista and Windows 7. If you don't like any of the desktop environments available you can always make your own. You can create your own desktop environment by combining your choice of window manager, desktop manager, terminal, menu system, panels and other applications.